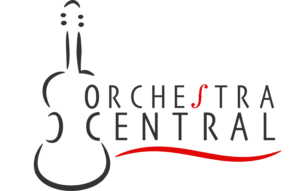 When it comes to conducting an orchestra or a big band, conductors should be aware of several factors that would make their performance remarkable. 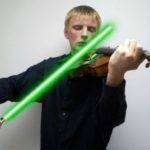 Everything starts with sufficient knowledge and skill in conducting. Constant practice of different techniques in such art will undoubtedly help them exude a refined yet emphatic performance with the band. It is also worth noting that conductors should also be equipped with the best conducting batons in order to come up with remarkable results. 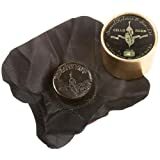 Picking the most suitable one among the best conducting batons will not only help conductors with their performances, but it will also prevent them from buying a new one time and again. There are a lot of conducting batons in the market, so a conductor might find it difficult to decide on which of the batons is the most appropriate to choose. In this article, we did a rundown on the best conducting batons in the market to guide conductors to get the job well done without causing too much trouble. An amazing conducting baton, the Mollard S14-RW is our favorite conducting baton due to its great balance and beautiful rosewood handle. Need a Conducting Baton Case? 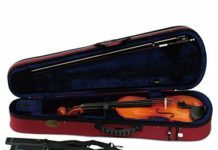 If you need a case to store your conducting baton in, check out the conducting baton cases available on Amazon. 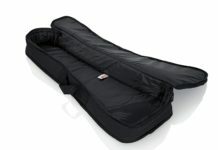 Most conducting baton cases go for $30-40 and will protect your baton from damage. They come in soft and hard case options, so pick one that you like and will suit your needs. Conducting batons are built with different qualities to provide distinct experiences and suit different styles of the person who will use them. When looking for the best conducting batons in the market, it might be overwhelming to choose from a bunch of products especially if you are still a beginner in the field. Here is a list of features that you should consider when deciding on the best conducting batons that will suit your preference. When choosing for the best conducting batons in the market, you might want to look at the material of the handle. Common made of cork, wood, or plastic. Cork is natural to shape in the hands, but it might be difficult to find a baton with proper balance because of its lightweight design. Plastic, on the other hand, may come out as cheap due to its poor craftsmanship. Some of the most common materials of the shaft include wood and fiberglass. Fiberglass-shafted batons are noted for their durability and flexibility. However, they are heavier and are more difficult to balance. Wood-shafted batons, on the other hand, are well-balanced and lightweight. Usually, wood is the baton shaft material which is more preferred by many conductors. It is worth noting that the balance point should also be considered when choosing for the best conducting batons in the market. Primarily, a balance point is correlated with the size of the baton. For example, the longer the baton, the further the balance point is. 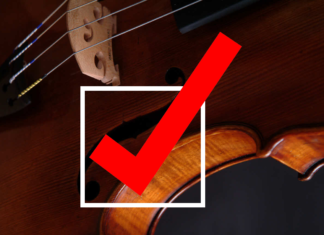 Ultimately the balance point is dependent on the preference and style of the conductor. 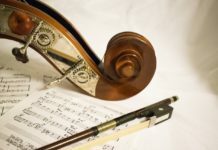 While there are several characteristics of a conducting baton which are recommended to help you in delivering a stellar performance, the decision on which baton to choose from will still depend on the expertise and experience of the person using it. As we have mentioned earlier, there are a lot of batons which are readily available in the market. However, some of them might cause you more trouble than deliver you a quality performance. To help you in deciding, we have listed ten of the best conducting batons. The Mollard S14-RW Baton is known for its excellent balance and optimal comfort. Its pear-shaped wooden handle is functional to those with relatively small palms because they can fully grasp the widest portion of the baton’s grip while their fingers rest comfortably around the shaft of the baton. Lightweight yet hefty, this conducting baton flows smoothly when used in performances. Made of rosewood, the Mollard S14-RW Baton is 14 inches long including its handle. This baton is highly recommended for experienced conductors and undergraduate students. The BQLZR Music Conductor Baton is one of the most popular batons due to its attractive and comfortable design. Equipped with a black rubber plastic ABS Handle, this baton is made of fiberglass which offers durability to the conductor. All the parts of the baton are made up of plastic with its shaft especially matte finished. Its shinier handle is glued simply to its shaft. 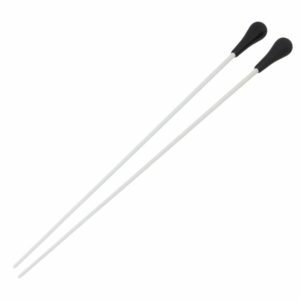 The BQLZR Music Conductor Baton comes in a pair of 15-inch batons. With its relatively inexpensive price, it delivers optimal performance for those who into a reasonably cumbersome baton. Sound Harbor Music Baton is an excellent conducting baton for music professionals, teachers, and even students. It is built on a fiberglass material with an imitation agate handle. The baton is 15 inches long and weighs approximately 2 ounces light. 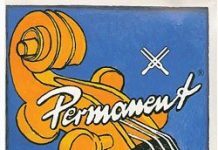 This provides a light yet efficient baton to those who are inclined to conducting, especially those who are still learning the art. The handle Sound Harbor Music Baton comes in different attractive colors including brown-black, yellow, and black. It also comes in a baton case to keep it secured when not in use. Famous for its lightweight and attractive design, the Mollard P14RW Baton delivers a precise balance and responsiveness to conductors. Made of rosewood, the baton is made to suit the standards of the music industry. Thin and professional-looking, the baton is resistant, and it is easy to carry around. Its handle provides comfort to the users for optimal performance. It comes with a plastic tube which protects it from outside elements which might scratch the baton. The conducting baton by Aibay is made of fiberglass to provide durability when used. 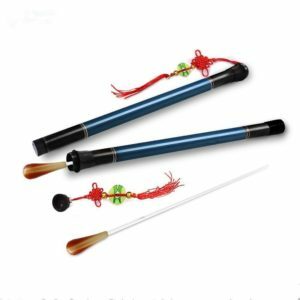 Attractive and comfortable, it is an ideal baton for teachers and students who are inclined to music. 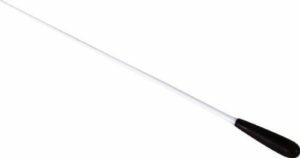 This 15-inch baton is well-balanced and lightweight to provide ease when conducting. Its imitation agate handle comes in two distinct colors: green and brown. The baton comes in two pieces. These pieces are kept safe through their respective baton cases. 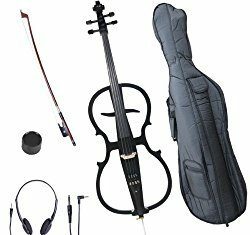 A Trophy TR12EC Symphony Baton is known for its well-balanced feature which could benefit students and teachers alike. 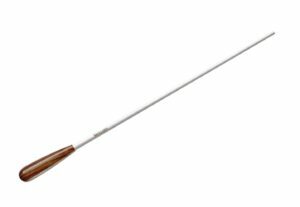 Made of Cocobolo, this 12-inch conducting baton is sturdy and well-built. It has the right size for those with relatively small hands. Trophy TR12EC Symphony is lightweight yet significantly durable. It also comes with a plastic cylinder which can be used as storage when the conducting baton is not in use. Recommended to music students and professionals, the King David 12WPCK Baton is known to deliver a better balance than other more expensive batons. Due to its pear-shaped cork handle, the conducting baton can be held comfortably by those with relatively large and small hands. Its white shaft is durable for rehearsals and performances. 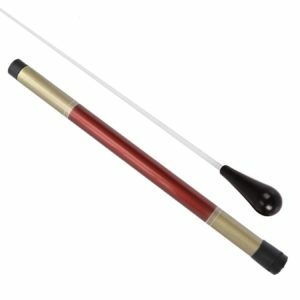 This 12-inch conducting baton is lightweight making it easy to handle. While it may be a little heavy at the tip, the baton still delivers a solid performance. The Donato Symphony Conducting Baton is a high quality and professional conducting baton which features a light, hardwood handle, and a white shaft. 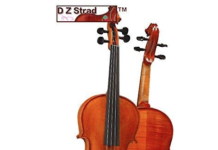 It may come in a 13-inch tear drop handle or a 15-inch pear-shaped handle, providing varied choices to conductors. Known to be well-balanced and well-crafted, the Donato Symphony Conducting Baton is optimized to offer conductors a solid baton for rehearsals and performances. Another entry from the brand, the Trophy TR12ER Symphony Baton offers a nice weight in hand. With a weight of less than one ounce, the conducting baton is significantly lightweight, providing a stable and optimal use. 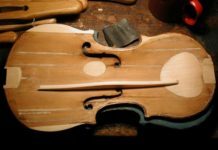 Its rosewood material construction is attractive. The Trophy TR12ER Symphony Baton is 12 inches long, providing conductors with just the right level of balance when used for performances. When choosing from the list of the best conducting batons mentioned above, you are assured of quality materials which are also lightweight and comfortable to use. Each of the conducting batons mentioned offers significant features which provide conductors with optimized performance.